Following the fortunes of Boeing and Airbus, you could be forgiven for thinking that aircraft manufacturers always run late, over budget, and the resulting end product can struggle to meet initial expectations. The Embraer E2. Source: Embraer. But Brazil’s Embraer, the world’s third-largest commercial jet maker, has shown with its next generation narrow body regional aircraft, the E-2 series, that it doesn’t have to be that way. Embraer introduced the aircraft at the Paris Airshow in 2013 and it was first displayed last summer at the Farnborough Airshow just 45 days after its maiden flight. The aircraft is set to be delivered on time, on budget, and even slightly underweight. 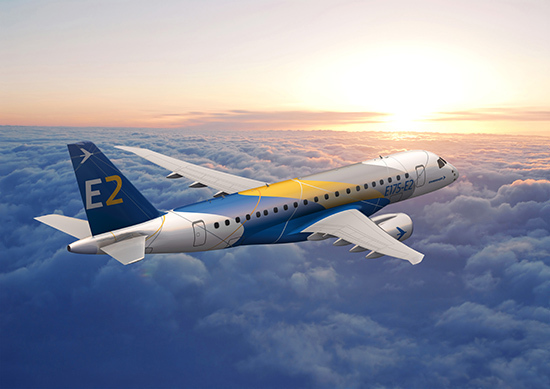 Embraer has been very successful with their current E-jet series and the new E-2 program looks set to maintain the company’s 55% market share dominance of the regional jet market. The E-2 will commence deliveries in the first half of 2018 and variants will be capable of carrying between 70 and 130 passengers. An FT article notes that Embraer has a backlog of commitments from airlines for 690 E2 aircraft, including firm orders of 275. A Washington, D.C. federal judge on Tuesday rejected the Cheyenne River Sioux Tribe’s bid to block operation of the Dakota Access pipeline on federal land in North Dakota, saying the tribe likely won’t be able to show that the federal government interfered with its exercise of religion on land outside the tribal reservation by allowing the project to go forward. Rising raw material surcharges are driving up U.S. steel prices, particularly stainless surcharges. 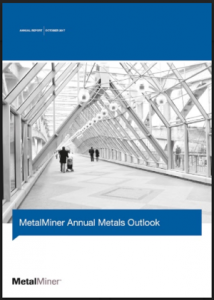 The Allegheny Ludlum304 and 316 stainless surcharges rose 34% and 25%, respectively, on the MetalMiner IndX from December to January. 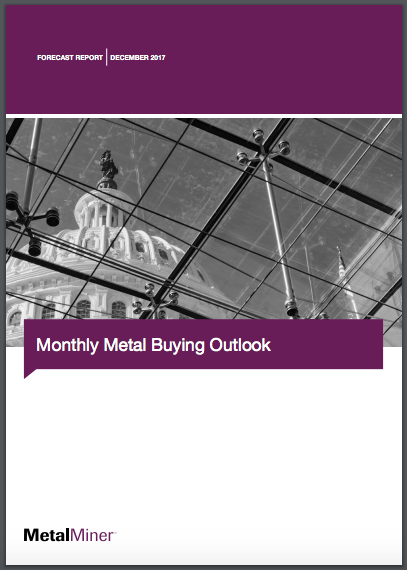 The chrome portion of our prices jumped month on month and Platts reported that the same thing happened to its stainless benchmarks. Turner Construction Company reported recently that its Fourth Quarter 2016 Turner Building Cost Index — which measures costs in the nonresidential building construction market in the U.S. — has increased to a value of 1006. This represents a 1.11% quarterly increase from the Third Quarter 2016 and a 4.90% yearly increase from the Fourth Quarter 2015. The U.S. construction market continues to experience broad growth, with the West and Southeast regions seeing more significant gains, and the Northeast and Central regions seeing more moderate gains. 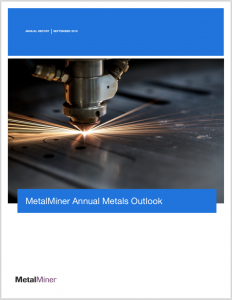 While raw material prices have remained flat, they have experienced an overall gain this year and fabricated material prices have seen a continuous growth this quarter. The Commerce Department has placed anti-dumping and countervailing duties on mechanical drive parts from Canada and China, some as high as 400% for the latter. U.S. auto sales are forecast to fall this month. U.S. auto sales are forecast to drop more than 7% in October from the same period in 2015, the sixth monthly decline so far this year, as automakers offer steep discounts and adjust production to manage inventories, J.D. Power and LMC Automotive said on Friday. This may be the fall from the plateau we have seen over the last few months of flat auto sales. Siemens and Local Motors announced a new partnership at the recent International Manufacturing Technology Show in Chicago, which is intended to help advance the future of manufacturing by optimizing the development and large-scale 3D printing of automobiles. The partnership combines the power of Siemens’ product lifecycle management (PLM) software technology with Local Motors’ leadership in co-created and 3D-printed vehicles — a process called direct digital manufacturing (DDM), wherein parts are produced directly from CAD files. All 115,612 International Manufacturing Technology Show attendees could ride Olli, Local Motors’ first 3D-printed, autonomous vehicle to get around the massive show floor. Source: IMTS. Local Motors plans to enhance productivity in its LM Labs program by leveraging Siemens’ expertise in creating “digital twins,” while Siemens expects to further enhance its digital enterprise software suite to support the latest advances in additive manufacturing/3D printing. 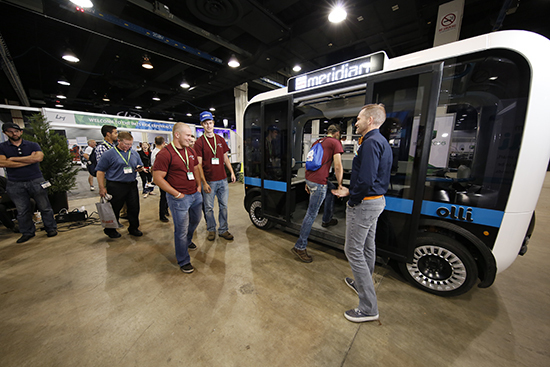 For the first time, Local Motors provided an autonomous vehicle, “Olli” that ferried IMTS goers throughout the halls of McCormick Place. The vehicle used Watson’s capabilities to enable riders to ask complex questions in “natural language” voice such as where to visit in Chicago while in town. Olli can be hailed by an app and is in real-life testing Local Motors testing locations right now including National Harbor, Md., Las Vegas and, later this year, Miami. The autonomous vehicle can take route instructions and explain what’s happening during the trip. Local Motors brought other 3D-printed vehicles — including Strati, the first 3D-printed show car created at IMTS 2014 — tot the show, too. On the Siemens side of the partnership, the PLM software provider insists that additive manufacturing is not in direct competition with existing manufacturing processes and will not completely replace them. “Instead, 3D printing will provide an ideal complement to traditional procedures like injection molding and milling,” said Ulli Klenk, chairman of the board of the Additive Manufacturing Association within VDMA — a German manufacturing association trade and certification association — and also manager of Siemens’ digital factory division. Klenk said the certifications and standards VDMA is working on will bring legitimacy to the technology and, within 10 years, additive manufacturing could effectively be commoditized with 3D printing powders and their prices treated as any other raw materials. Reorganization for Bohai Steel; Commercial Space Flight Standards Coming? China is planning a bailout of sorts for Bohai Steel Group and standards organization ASTM International wants to develop certifications for commercial space flight. Financial authorities in Tianjin, China, plan to convert a portion of debt-stricken Bohai Steel Group‘s liabilities into bonds, according to rescue plans drawn up recently, the online financial magazine Caixin reported on Monday. According to the plan, high-quality assets from Bohai Steel will be restructured to form a new company, which will take on 50 billion Chinese yuan of the total debt. Officials met last week to discuss a comprehensive restructuring plan for the firm, which has liabilities of $28.78 billion (192 billion yuan) from 105 creditors. ASTM International will host an organizational meeting to potentially create a new technical committee that develops voluntary consensus standards for commercial spaceflight. This meeting comes in part as a result of the updated U.S. Commercial Space Launch Competitiveness Act of 2015 (SPACE Act). The U.S. Federal Aviation Administration’s Commercial Space Transportation Advisory Committee (COMSTAC) Standards Working Group is recommending the organization of the new group. Yesterday, Commerce Department placed initial countervailing duty tariffs on imports of circular welded carbon-quality steel pipe from Pakistan. For the purpose of countervailing duty investigations, a countervailable subsidy is financial assistance from foreign governments that benefits the production of goods from foreign companies and is limited to specific enterprises or industries, or is contingent either upon export performance or upon the use of domestic goods over imported goods. Commerce calculated a preliminary subsidy rate of 64.81% for the mandatory respondent, International Industries Limited. The preliminary subsidy rate is based on facts available and adverse inferences following Commerce’s preliminary determination that the mandatory respondent and the Government of Pakistan had not fully cooperated in the investigation. All other exporters/producers in Pakistan have also been assigned a preliminary subsidy rate of 64.81%. The investigation covers welded, carbon-quality steel pipes and tube, of circular cross-section, with an outside diameter not more than nominal 16 inches imported from Pakistan. Source: Adobe Stock/ pavelyudin. Commerce will instruct U.S. Customs and Border Protection to require cash deposits based on these preliminary rates. The petitioners in this investigation are Bull Moose Tube Company, EXLTUBE, Wheatland Tube, and Western Tube & Conduit. 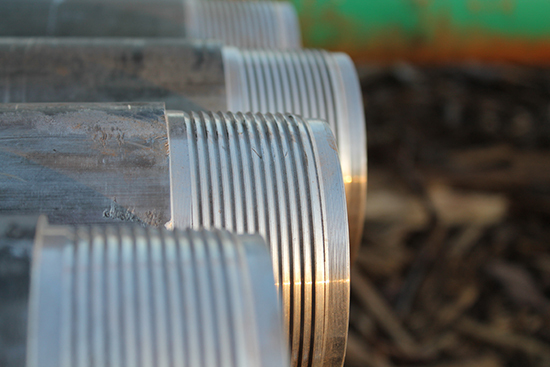 The investigation covers welded, carbon-quality steel pipes and tube, of circular cross-section, with an outside diameter of not more than nominal 16 inches, regardless of wall thickness, surface finish, end finish, or industry specification, generally known as standard pipe, fence pipe and tube, sprinkler pipe, and structural pipe.